This spicy Catalan sauce is thickened with ground almonds and bread. It's served in Spain with a type of grilled onion, but you can serve it with any grilled vegetables, chicken or fish, or even as a dip with chunky chips. If you can't find dried bell peppers, substitute 100g chargrilled red peppers (try bottled pimientos del piquillo), which don't need to be soaked. Just chop and add along with the chilli, garlic and bread. Deseed the dried peppers and roughly tear. Soak in 100ml hot water for 20 minutes. Heat the oil in a frying pan over a medium heat and fry the whole garlic cloves for 1-2 minutes until just golden. Remove and reserve. Quickly add the bread to the oil and fry for 2-3 minutes until golden, stirring constantly. Remove with a slotted spoon and drain on kitchen paper. Reserve the oil separately. Drain the peppers, reserving the liquid. Put the almonds in a food processor with the bread cubes, soaked peppers, dried chilli, fresh pepper and garlic cloves. Purée to a rough paste. Transfer to a bowl. Add the reserved oil to the pepper water (if using) then stir in the vinegar, tomato purée, saffron and water, and paprika. Season. Slowly add this liquid to the almond mixture until you have a loose paste. If it's too thick, add more olive oil. Store in the fridge, but serve at room temperature. 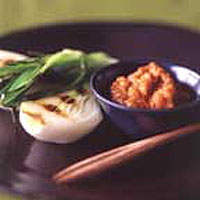 This recipe was first published in December 2002.